Popular Science magazine's blog posted a story by Sean Captain about this device (above) on January 2, 2008, but I didn't happen on it until yesterday when I was browsing the magazine section at Barnes & Noble. By bouncing pulses of red, green, and blue laser light off a vibrating mirror, the PicoP can paint WVGA (848x480-pixel) images measuring up to 100-inches diagonally in a dark room — or about 12 inches under bright lights — on a wall, tabletop or any other surface. For starters, though, Microvision will bundle the PicoP with a battery in a separate handheld device, about the size of an iPod called the SHOW, a prototype that the company debuted today. Microvision says it’s already inked deals with companies that will sell the SHOW under their own brands before year’s end. Prices aren’t set, but spokesman Matt Nichols says they could be made and sold profitably for under $500. Microvision appears to be leading the slow-paced race with Light Blue Optics and Texas Instruments to bring the first micro projectors to market. Like Microvision, TI did show an early prototype laser projector at last year’s Consumer Electronics Show. 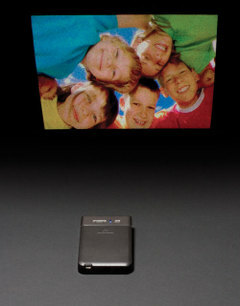 But TI has since decided to switch from lasers to light-emitting diodes for its Pico Projector, and it is not expected to show anything new at the 2008 CES next week. ...but the battery weighs 20 kilos and comes with its own trolley. I'll take one as well. Cool!